Dan White is trying to acclimate to civilian life after a long career in the military with multiple combat deployments. Now he’s home in the Austin area, living with his brother Dixon, Dixon’s husband, Audie, and their two nine-year-olds. During the New Year celebration, Dan meets Abraham Weldon, and the connection is instant. There’s a kiss. There’s a dance. There’s a proposition. Then Dan finds out Weldon is bisexual. With five kids. Five kids, one of whom is a blind fifteen-year-old. Weldon has been in love twice in his life—with his high school best friend, Blake, and with his wife, Krista, who he met in a Dairy Queen as she was crying over a positive pregnancy test. Love number three hits Weldon like a hammer when he meets Dan. But since Dan isn’t interested in a guy with kids, they might only get one night together. This book took a bit for me to get into, but once I got into it I really enjoyed it. I loved how the kids were active in the book and not just props left in the background. Dan is ex-military and trying to adapt to civilian life, that is so hard and I don’t think people really understand that and I liked how the author tried to show this. Abraham aka Weldon, man, he is a little firecracker and I fell in love with him instantly. The sparks between Weldon and Dan are so hot from the beginning all the way to the end of this book. There is a little angst with the eldest son and then a fight between Dan and Weldon, the rest is just real life situations and a really good story. This book was my introduction to B.A. Tortuga and I can now say that I liked her writing style and had no problem reading this book. I also found this book to be a bit more unique for an M/M romance as it did have a large basis on family with multiple children playing large roles in the plot. I did not read the first book in this series, but I had no problem with this book as a standalone, and I think the author did a good job of making sure the reader wasn't missing anything. Dan White is doing his best to return to civilian life after leaving a long military career. He's staying with his brother and family while he tries to get back on his feet. He just didn't expect it to be so hard to adjust. He goes out to a New Year’s Eve party with his brother and brother's partner when he meets a friend of theirs and knows this guy could be just the distraction he needs. Abe Weldon is instantly attracted to Dan and finds himself having one of the best times he's had in a long time, but he's disappointed that Dan doesn't seem to be into kids and commitment, both of which he has or wants. When Dan finds out that Weldon is a single dad with five kids at home, he is a bit taken aback, but as he sees Weldon with his kids, he gains a lot of respect for him and sees how chaotic his life can be and how well he juggles it all. As time moves forward, the two can't help but see each other often, and each time the chemistry is even stronger. The author does a nice job of showing how big households work and I liked how she integrated the relationship with it. The family basis of the entire book was nice to me. I enjoyed meeting ALL of the kids and seeing Audie and Dix (Dan's brother) and their kids in the mix as well. It had a loving, yet realistic feel throughout that I found refreshing. I did have a few minor annoyances while reading, but they didn't bother me too much to stop reading. Some word choices were definitely odd. I kept being pulled from the story to think about why that word or another was chosen. I also didn't think that a situation with one of the children was resolved properly. It was resolved, but much of the emotional side of it for the child was brushed aside. I also found that the majority of the conflict was left for the end of the book, leaving the end feeling rushed and then just over. Overall, I definitely enjoyed this book. Dan and Weldon are adorable by themselves, but adding the kids into the mix made me fall in love even more. I will be looking into more by B.A. Tortuga and I will recommend this book to Romance and M/M romance fans to enjoy. It’s funny how just a year and a half ago, I’d never even heard of BA Tortuga, much less read one of her books. And even though the first book in this series, Ever the Same, was only the second book by the author I’d read 17 months ago, I knew then that she was an author who was firmly fixed on my must-read list. Needless to say, when Real World came up for review, I jumped at the chance because not only was I dying to read the sequel, but ten books later I am a big fan of Tortuga’s writing. I freaking loved this book. I loved Dan. I loved Weldon. I loved Weldon’s kids – all five of them. I loved that we got to catch up with Audie and Dixon, not only because Dixon is Dan’s brother, but also because Audie is Weldon’s friend and their little girls are best buds. That Dixon is Weldon’s son’s guitar teacher just adds another level to how much their lives are entwined. And that level of involvement makes Dan’s hesitation to get involved with Weldon not only admirable in its honesty, but understandable. It makes Dan’s withdrawal from Weldon believable. It also made for a major sigh of relief when Dan eventually got himself together enough to realize that Weldon and his children were offering Dan everything he never knew he needed or wanted. Watching Dan fall into family life was absolutely beautiful because he not only embraced the love of a man who came with kids, he embraced the love of those kids, claiming them as his own. But don’t let me fool you into thinking everything is sunshine and unicorns, because Dan and Weldon face some serious obstacles along the way, which makes the resolution that much richer. I loved watching Dan and Weldon fall in love. Their initial liaison was hot and was definitely a case of lust at almost-first sight. The physical connection did not translate straight into love because Dan was upfront about not wanting kids, which made Weldon determined to keep Dan in the friend-zone. But the more time they spend together, the more the sparks fly – I loved that they literally could not keep their hands off one another. I suspect some readers will judge Dan harshly for not wanting kids and ruling out a relationship with Weldon because of it, but as we learn more about Dan, I understood where he was coming from and I was glad that he took Audie’s advice to heart. The storyline regarding Jakob was both expected and unexpected in that I saw it coming, but in that “I really hope that’s not what’s going on” way. Tortuga did a great job of making me feel badly for Jakob and absolutely devastated for Weldon. I was on tenterhooks as that played out and was never so glad that a character was ex-military as I was when Dan stepped in to protect his family. But the best, the absolute best part of Real World, was the epilogue. I cannot wait for the next book in the series so I can catch up with everyone again. 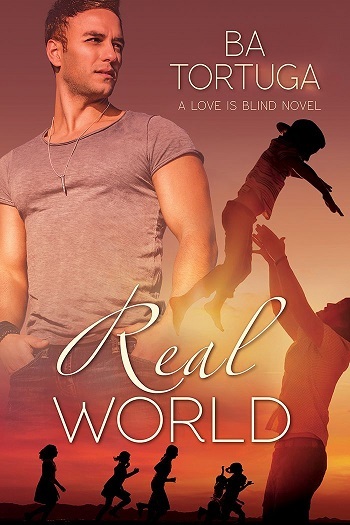 Reviewers on the Wicked Reads Review Team were provided a free copy of Real World (Love is Blind #2) by BA Tortuga to read and review.